I recall from a walk in Wensleydale a year or two ago, an unexpected fork in the path that my friend Patrick and I were taking down a hill called Addlebrough. There seemed to be two ways back to our starting point. 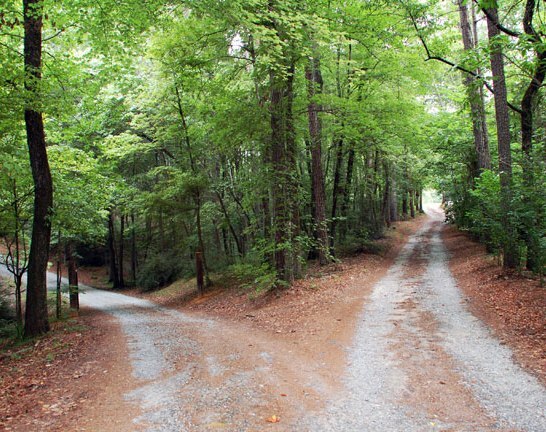 For some reason the phrase ‘the path not taken’ came into my mind, and I briefly pondered that I might never find out what would have been different if we had taken the other path to the one that we decided to take. Patrick said that the phrase was ‘the road not taken’ and it was the title of well-known poem. 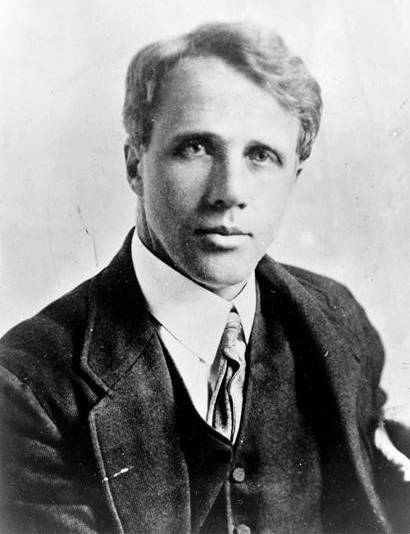 The Road Not Taken is a poem by the American poet Robert Frost in the preface to his collection of poems Mountain Interval which was published in 1916 when Europe was engulfed in the Great War. Robert Lee Frost (26 March 1874 – 29 January 1963), the American poet, was born in San Francisco. His poems were often set in rural life in New England in the early 20th century. He was much honored during his lifetime, receiving four Pulitzer Prizes for Poetry. Frost spent the years 1912 to 1915 in England, and in 1913 he became a close friend of the then writer and literary critic Edward Thomas, after Thomas had reviewed one of the older poet’s collections. They took many walks together in the fields and woods around Frost’s cottage in the village of Dymock in Gloucestershire. In 1915, Frost returned to New Hampshire and he sent Thomas an advance copy of The Road Not Taken. The poem was intended by Frost as a gentle mocking of indecision, particularly the indecision that Thomas had shown on their walks. Thomas would often choose one fork in the road because he was convinced it would lead them to something, perhaps a patch of rare wild flowers or a particular bird’s nest. When the road failed to yield the hoped-for rarities, Thomas would rue his choice, convinced the other road would have doubtless led to something better. Frost wrote to Thomas ‘no matter which road you take, you’ll always sigh, and wish you’d taken another.’ Unfortunately Thomas took the poem more seriously (as had college audiences to whom Frost had read his poem), and more personally than Frost had intended. So close was the friendship that had developed between them when Frost was in England, Thomas and Frost had planned to live side by side in America, writing, teaching, farming. But Thomas was a man plagued by indecision. He also suffered from chronic depression. He found it difficult to choose between a life with Frost and the pull of the fighting in France, even though he despised the jingoism and the hatred of Germans that the press was stoking. The Spanish-born American philosopher George Santayana said in 1905 ‘those who cannot remember the past, are condemned to repeat it’. This concise thought (or aphorism) has been much quoted and has been re-phrased as ‘those who cannot learn from history are doomed to repeat it’ or ‘those who fail to learn from the mistakes of their predecessors are destined to repeat them’. The meaning then is that one should look back in history to see the mistakes that were made and avoid repeating them. But like many subjects such as science, sociology, archaeology and so on, facts are open to interpretation, and in the case of history, it is the job of the historian to research the facts and put forward an argument for the whys and wherefores of events from the past. But what if the facts themselves are distorted? Does this diminish the worth of history? Two quite different instances come to mind, of how history can be twisted. Oh! 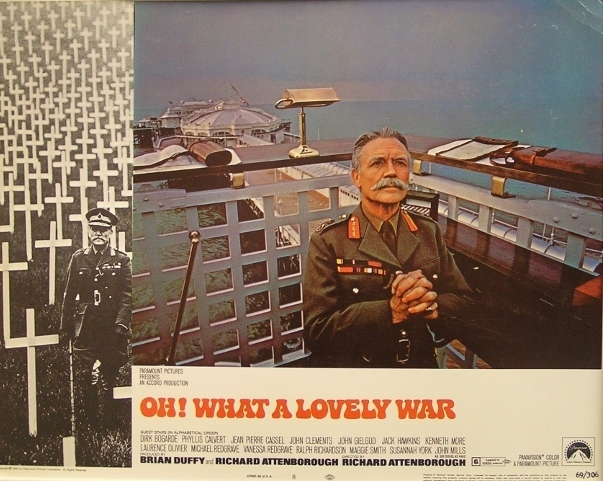 What a Lovely War was a musical film directed by Richard Attenborough and based on the stage musical of the same name developed by Joan Littlewood as a satire on the First World War at the Theatre Workshop in 1963. The title was a popular music hall song written originally in 1917. Many of the songs were the witty and cynical ones sung by British soldiers, ‘Tommies’, during the war. The film was released in 1969 and the cast included Dirk Bogarde, John Gielgud, Jack Hawkins, John Mills, Kenneth More, Laurence Olivier, Michael Redgrave, Ralph Richardson, and Maggie Smith. Unfortunately Gove in acting as the scholar shows his ignorance of history and his own preference for myth-making. In saying that the war was a ‘just war’, a ‘noble cause’, which was ‘fought by men to defend the western liberal order’, he forgets that one of Britain’s main allies was the Russia of Tsar Nicholas II, whose brutal autocracy was far more ruthless than that of Germany’s authoritarian Kaiser Wilhelm. And what was the western liberal order? Germany was certainly more democratic electorally than Britain. 40% of adult males in Britain didn’t get the vote until 1918, whereas every adult man in Germany had the right to vote since before the start of the conflict, and the largest political party, the Social Democrats, unsuccessfully opposed annexations and the militarism of the German elites. This map shows the British Empire in 1901 on the death of Queen Victoria. By this time, Britain had been the foremost global power for more than a century and London was the economic capital of the world. This was derived in large measure from the exploitation of the natural resources and cheap labour in its colonies. 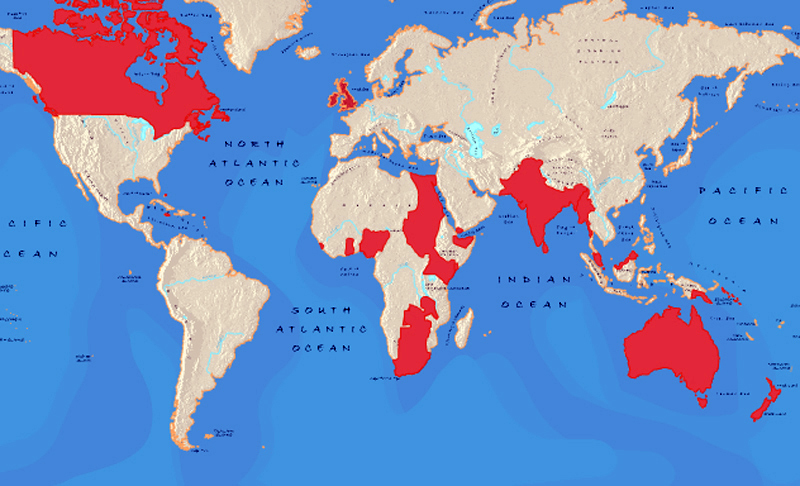 The empire reached its largest territorial extent in 1922, though because of the impact of the First World War it was no longer the only major industrial or military power. The German elite was certainly expansionist, they envied Britain and France with their vast colonies overseas. By the early 1900s, Britain had become the largest empire in history, and by 1922 held sway over one-fifth of the world’s population. It was ‘the empire on which the sun never set’ because its expanse across the globe meant that the sun was always shining on at least one of its territories. Germany wanted its ‘place in the sun’. But were these British colonies, dominions, protectorates, and mandates, obtained by peaceful means? Were they governed benignly? They were not. For example, in the period 1896-97, about five million people died from famine in British-ruled India as colonial officials enforced the export of food to Britain. In the period 1901-02 in British concentration camps in South Africa, 28,000 Boer people died from starvation, 22,000 of them children, which is about 10 per cent of the Boer population, and about 20,000 black people died in other camps. Vietnam, Cambodia and Laos in south-east Asia became part of French Indochina between 1887 and 1893, France’s motive being to exploit the countries’ resources, raw materials and cheap labour. The French seized vast swathes of land and reorganised them into large plantations, with millions of people forced to work long hours for wages that were pitifully small in debilitating conditions for the benefit of their French overlords. Up until the First World War, and beyond, thousands upon thousands of native people died through malnutrition and disease on the plantations. You may have heard that water flowing down the plug hole in a sink or bath always swirls anti-clockwise in the Northern Hemisphere, and clockwise in the Southern Hemisphere, and that this is due to the Coriolis effect. The Coriolis effect (or Coriolis force) was first postulated by the French scientist Gaspard-Gustave Coriolis in relation to the behaviour of water wheels in 1835, but so far as the Earth is concerned, it is the deflection of the atmosphere and the oceans, and large objects on the surface of the Earth, due to the earth’s rotation around its axis. Cyclones, and jet streams in the upper atmosphere, are two of the more obvious phenomena caused by the Coriolis effect, but the effect also causes certain types of waves to form in the oceans. However because the earth spins relatively slowly, the apparent force that its rotation generates only becomes significant over large distances or long periods of time. In the First World War, the Paris Gun was used to bombard Paris from a range of about 120 km (75 miles). Because of the distance, the Coriolis effect had to be taken account of in the calculations of the trajectory. The Coriolis effect became important in external ballistics for calculating the trajectories of very long-range artillery shells. 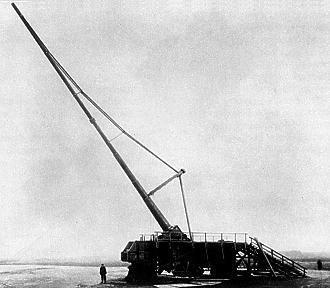 The most famous historical example was the Paris gun, used by the Germans during the First World War to bombard Paris in 1918 from a range of about 120 km (75 miles). The distance was so far that the Coriolis effect was substantial enough to affect trajectory calculations. Incidentally, the shells of the gun reached a height of 40 kilometers (25 miles, 131,000 ft) and were the first man-made objects to reach the stratosphere. However, the direction in which water flows down a plug hole is not influenced by the Coriolis effect, which is tens of thousands of times weaker than other factors such as the existing disturbance in the water, the angular momentum that causes the initial vortex, and the shape of the bowl. Despite this, popular entertainment has maintained interest in the Coriolis effect. 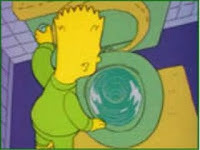 Bart vs. Australia, the sixteenth episode of the sixth season of The Simpsons, starts with Bart Simpson noticing that the water in his bathroom sink always drains anti-clockwise (counterclockwise in the USA). Bart does not believe Lisa, his sister, who explains that this is due to Coriolis effect, and that in the southern hemisphere the water drains the other way round. To confirm this, Bart makes phone calls to various countries in the southern hemisphere, ending up with a call to Australia. Here a little boy, who lives in the outback, confirms, having also checked with his neighbours, that the toilets and sinks are all draining clockwise. The plot continues with Bart being sued by the boy’s father for the cost of his six-hour ‘collect’ call, with Australia indicting Bart for fraud, the USA wanting to send him to prison to placate the Australian government, Bart having to make a public apology in Australia, and so on. However in 1962, Ascher Shapiro, a researcher at the Massachusetts Institute of Technology in Boston, USA, was able to demonstrate the Coriolis effect on draining water, and this was later repeated by scientists in Sydney, Australia. But this was only achieved by using a perfectly circular bath 1.8m in diameter and 15cm deep, and by allowing the water to stand for 24 hours so that any currents from filling would die down. A small outlet, on the outside, meant that the water took about half an hour to drain away. Under these conditions, the Boston researcher reported a tendency for water to swirl anti-clockwise (viewed from above), whilst the scientists in Sydney described seeing water swirling clockwise. So to observe the Coriolis effect at home, you would need a large but shallow circular bath, and one that’s not affected by any vibration or disturbance, as well as plenty of time. These eyes are in the ceiling of a well-known building. Do you know which building and where it is? If you know the building you might have an idea of who commissioned the eyes to be painted? 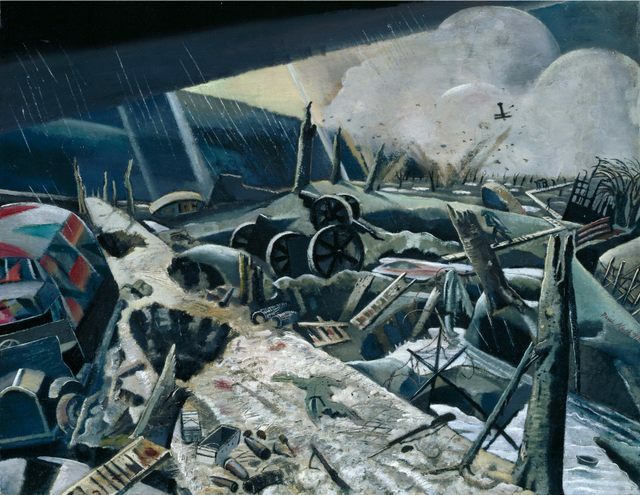 Working from memory, Nash depicted the total devastation of the Great War, shocking the viewer’s sensibilities. This dark, hellish scene reveals the war’s desolation, destruction, and terror. A new exhibition has opened at Dulwich Picture Gallery in south London, Nash, Nevison, Spencer, Gertler, Carrington, Bomberg: A Crisis of Brilliance, 1908-1922. These six artists, David Bomberg, Dora Carrington, Mark Gertler, Paul Nash, Richard (C R W) Nevison, and Stanley Spencer, were all students of the Slade School of Drawing, Painting and Sculpture at University College in central London in the years around 1910. The Slade was then opening its doors to a remarkable crop of young talents, what the Professor of Drawing, Henry Tonks, later described as the school’s second and last ‘Crisis of Brilliance’ (the first included Augustus John, Percy Wyndham Lewis, and William Orpen). Bomberg, Nash and Nevison became war artists in the First World War, and Nash and Spencer were also war artists in the Second World War. In A Crisis of Brilliance: Five Young British Artists and the Great War (Old Street Publishing, 2009), David Boyd Haycock tells the story of this entangled, war-defined group (Bomberg was not included). The exhibition, in bringing together more than 70 original works including paintings, drawings and prints, plus original letters, documents and photographs, shows how the First World War crushed the ambitions of that generation of talented artists, who felt that they had failed to portray the full horror of the slaughter.